As the forthcoming book, The Knowledge Work Factory, argues, there is only one underlying element common to all business improvement, and that is standardization. Specifically, this can be traced to the world of manufacturing, and its three timeless principles of standardization, specialization, and division of labor, famously described by the economist Adam Smith back in 1776. Yet as knowledge workers have come to represent the bulk of today’s labor force, their productivity gains have not kept pace with modern computing power; this is the infamous Productivity Paradox first described by Nobel laureate Robert Solow in 1978. Yet knowledge workers also lag far behind their manufacturing counterparts as well, in terms of productivity gains over the last 100 years. Now, however, it appears that robotic process automation, or RPA, is poised to come to the rescue. In this article, we will explore the roots, realities, and possibilities of RPA, and how you can apply them to your business. We’ll cover its history, things to watch out for, how to implement it, and the different types of training available. 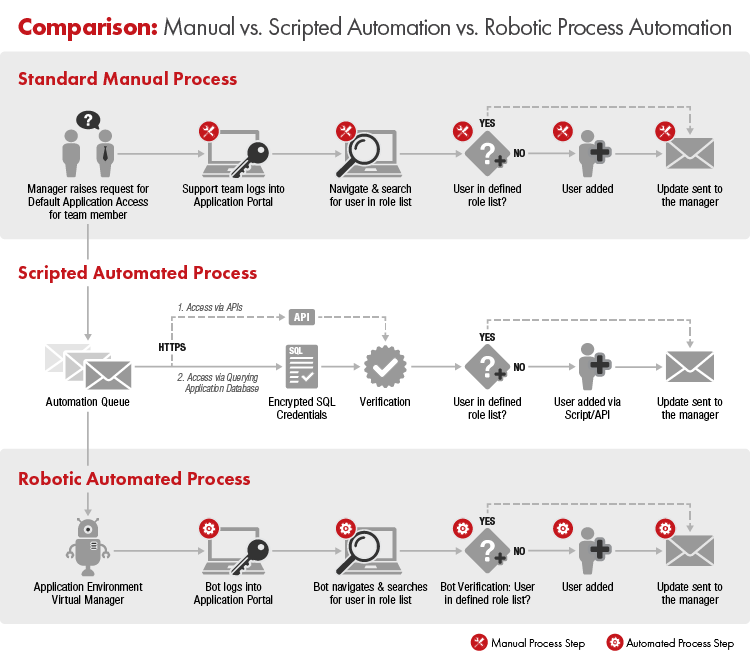 What is robotic process automation? A simple definition of RPA. Who makes robotic process automation software? The past 30 years have witnessed a multitude of new core IT systems being implemented in businesses. These include on-premise systems, cloud-based applications, and a wide range of desktop applications, all being used daily—and simultaneously. The resulting landscape, strewn with disparate systems, has left a long tail of micro-level data-processing gaps between them all. These system-to-system gaps are not being filled by other systems; currently, they’re being filled by people. In other words, there’s a lot of copying-and-pasting going on today to connect every System A with System B, not to mention C, D, and E, etc. It’s clearly a ripe opportunity for the convenience and processing power of robots. Using robots to process work is not a new concept. As most people know, robots have been used on assembly lines for decades to assist in the production of automobiles, as well as other manufactured products. With RPA, white-collar, or knowledge-work processes, now have the opportunity to benefit from the equivalent of factory robots—with a speed of implementation and processing that promises a seismic shift in knowledge-work operations. 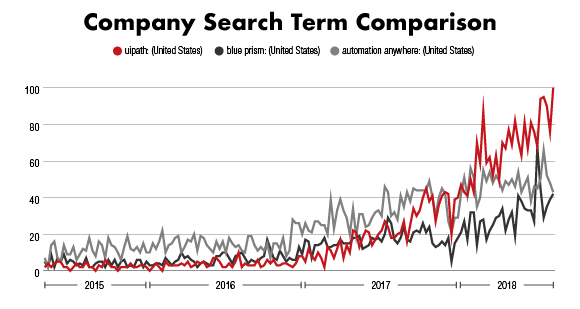 Just looking at search-history trends, you can see that robotic process automation interest in growing. Robotic process automation is defined as the implementation of software robots that are configured at the graphic-user-interface level on individual computers, end-user devices, or by work-station—and in turn used to automate routine and repeatable tasks currently conducted by white-collar or knowledge-work employees. The robots themselves are created in applications such as UiPath, Blue Prism, or Automation Anywhere. RPA was created to enable automation at the graphic-user-interface or GUI level, allowing users to see what they’re creating. This distinction is essential: It allows employees who lack computer-coding skills to connect disparate applications all by themselves. Prior to the advent of RPA, this required considerable back-end system-level coding by trained IT professionals, using application programming interfaces or APIs or scripting. Thus RPA can be seen as the democratization of programming, handed directly to the knowledge workers who need it most. Robotic process automation is a fancy name used to describe software robots that automate manual routine data-entry and transcribing tasks across different systems which burden knowledge workers—and consume up to 50 percent of their days. Robotic process automation seeks to solve the “long-tail problem” of automation and the overwhelming number of micro-level tasks required to fill data-processing gaps between core IT systems and disparate desktop applications that exist—and persist—throughout knowledge-work business operations today. In theory, robotic process automation can be used to automate entire processes. But in more common and achievable applications, RPA is used to act as a “micro task” bridge automation tool that closes data transcribing gaps between core systems and data, email, or word-processing applications. Think of it as a macro that can switch between apps. 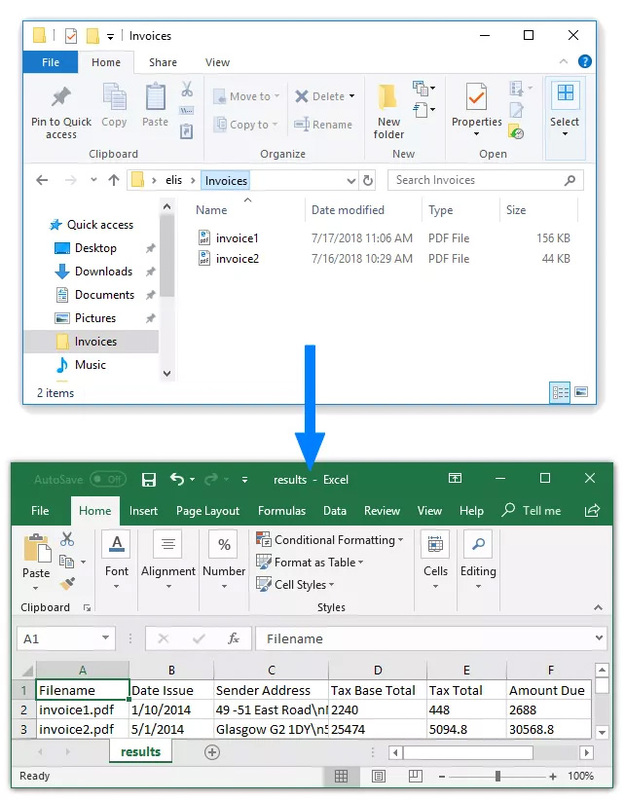 The below screen shots show how RPA can scrape data from closed PDF files into an Excel document with ease. What Are the Uses of Robotic Process Automation? With robotic process automation, all types of industries can speed up the processing of transactions, streamline operations, automate responses, transfer data, and bridge communication with other systems. Open, log in, and toggle between different applications and systems. Copy and paste data from spreadsheets to core systems. Move data from core systems to spreadsheets. Move information from Core System 1 to Core System 2. Pull data from invoices into a core system. Open an email and move its data into a core system. Move files and folders from desktops to servers. Scrape information from the internet and websites. Calculate data automatically to create reports. These are all processes which are currently performed manually, making them tedious, tiresome, and error-prone. In the finance and accounting world, for example, RPA can mean your workers spend less time on invoicing-processing-related data entry, gathering, and transcribing, allowing them to spend more time on decision-making functions, like analytical review and presentation creation. As another example: in banking, RPA lets workers integrate “the last mile” across business units and the back office themselves, enabling banks to automate data related retail branch processes, commercial and consumer lending administration, loan processing reconciliation, underwriting, and anti-money-laundering. RPA also helps with the “last mile” in health insurance claims. RPA insurance use cases involve automating simple, repetitive tasks that take up administrative and clerical time, such as copying and pasting batch data from an email into an underwriting application. By automating these routine tasks, health insurance claims staff can focus on more important, high-level work. 1. Do you need to know coding for RPA? No, but knowing basic code is a plus. 2. How much does robotic process automation cost? The cost of the UiPath Commercial Products license depends on the number of robots and developer studios chosen. The average cost is roughly $100K for medium scale implementations – and we are talking about software only. The “Community Version” is free!!!! But only for everyone to try and test. Pricing for single computer licenses starts around $1000 and goes up from there. A full UiPath RPA Orchestrator version with a “central command station” that you can manage multiple bots on multiple computers will run $30,000 on the low end. Once again, that is just software cost. You can easily add 200-300% of consulting cost on top if you need use cases identified and robots configured too. 3. How long does installation take? This depends on the length and complexity of the process. Basic robot configuration will take about 4 days to build and test. Other, more complex “linked” bots have taken as long as 2 weeks. 4. Is this something an analyst can learn? Yes, although becoming skilled can take 2-6 months, depending on the individual and the time dedicated to training. 5. Can a line of business run their own projects (instead of a centralized IT team)? A dedicated analyst can build, test & manage bots from their own UiPath studio. Creating a “Robotics Center of Excellence” is the easiest way to ensure RPA implementation standards across the company, govern robots, and ensure RPA success. You don’t need to be the CIO or CTO of a major corporation to enjoy near-term benefits from implementing RPA software in your company’s processes. Today’s business-unit leaders, mid-level managers, and front-line employees are taking on robot creation on their own—without the help of their IT departments, in many cases. Increased accuracy, reduced errors. All of the errors arising from human data-transcribing and input are virtually eliminated with RPA. That’s because, with RPA, there’s no longer a need for a person to manually move large amounts of transaction information between applications. Boosted productivity. Knowledge workers can spend (“waste”?) up to 50 percent of their days simply moving and reconciling data. RPA can reduce these data-movement tasks up to 80 percent, freeing knowledge workers for higher-value-added work and increased transaction processing. No changes to existing IT infrastructure or applications. Unlike traditional back-end automation, RPA works as a front-end layer across existing systems and applications. It functions right at the presentation layers of software—just as employees processing the work currently do. Quick installation and configuration. RPA implementation of low-complexity processes can require cycle times of less than four weeks. Reliability. RPA won’t get sick, take vacation, or quit in the middle of the day. Reduced processing cost. With attended RPA (definition in “Attended vs. Unattended” section below), 30- to 40-percent process cost reduction is possible. With unattended RPA, cost reductions can reach 45 to 80 percent—but unattended RPA has higher levels of implementation risk vs. reward. Reduced operational risk. Standardized workflows reduce common risks facing knowledge-work operations. Improved system data quality. Cleaner data input into systems (thanks to reduced manual errors) increases the value of big-data investments; it also enables future predictive analytics capabilities from richer data. Stated simply, bad data in is bad data out; RPA can reduce this. Improved customer journeys and experience. RPA can increase customer satisfaction via faster turnaround times and increased attention to customers’ needs: If customer reps spend less time on after-contact work—and more time interfacing with the actual customers—customer satisfaction scores will increase. Improved employee morale. Repetitive, manual work interferes with focus on core job-position responsibilities, dragging down morale and increasing boredom. Offloading these tasks, by contrast, makes employees happier and feel more valuable to the organization. Improved regulatory compliance adherence. Robotic processing follows exact commands and specifications, while providing an auditable and recordable history of every step of the process. This guaranteed adherence to compliance process checkpoints reduces risk. Low technical skill barrier to entry. As noted earlier, there is no need to master a complex coding language to control software bots. RPA is configured at the presentation layer, using symbols and drop-down menus to create robots; after just a few weeks of training, employees can administer robots themselves. Walmart. CIO Clay Johnson says the retail giant has deployed about 500 bots to automate everything from answering employee questions to retrieving information from audit documents, freeing up employees “who are tired of the work,” as he described it. American Express. David Thompson, CIO of American Express Global Business Travel, uses RPA to automate the process for canceling an airline ticket and issuing refunds—and is looking into using RPA tools to facilitate automatic rebook recommendations in the event of an airport shutdown. Equifax uses RPA bots to reduce the processing time required to complete credit-highlight reports for mortgages. The robots also now handle data-entry tasks that previously required employees to juggle as many as 20 different computer program windows at once. In total, RPA has been applied to 65 different processes at Equifax. Unum. This insurance giant was an early adopter of RPA software back in 2016; today, it employs 30 assisted RPA bots and another 10 unassisted bots (“assisted” and “unassisted” will be explained in detail shortly) that handle customer-information and policy-administration tasks. RPA has been so successful, according to Rex Price, Unum’s technology capability manager, that they hope to increase their number of RPA bots to 75 by the end of 2018. One of the world’s largest consumer-packaged-goods companies used RPA to reduce the manual effort required to set up trade promotions across 180 countries. This resulted in nearly $1 million in net savings, increasing the operational window from nine hours to 20 hours—and reducing overhead by 37 percent. Vodafone has been highly optimistic and excited as the leading telecommunication company introduced RPA. Said Israel Exposito, Vodafone’s global process lead of big data: “RPA became attractive not just because of the opportunity to reduce costs but also because it liberates our employees from boring and repetitive tasks, giving them back time to focus on more interesting activities that require higher competencies. Nobody wants to spend years and years of study to wind up in a job doing copy-paste over and over again.” Since implementing RPA, Vodafone has surpassed its goal of a perfect-purchase-order rate of 80 percent, achieving a record 92 percent. The history of RPA closely resembles the evolution of its mechanical predecessors: industrial robots. The first true industrial robot was created in 1954 by robotics genius George Devol (owner of Unimation Corp.) to automate the moving of items from one place to another less than 12 feet away. Just a few years later, in 1961, General Motors began adopting these robots on a large scale across its assembly lines. The first industrial robots were simple. They were used to automate tasks such as picking up, moving, and placing items on the assembly line. Yet as new technological breakthroughs appeared—such as sensors and cameras which allowed the robots to “feel” or “see” what had to happen next—they quickly grew in both complexity and capability. Fast-forward to 2018: There are now nearly two million industrial robots being used in factories. And the pace of robots being installed is estimated to rise 14 percent annually through 2020—meaning that almost three million robots will working in factories by then. The principles of robotic process automation mimic those of their industrial predecessors. Whereas industrial robots moved things from one place to another, RPA was created to move data from one place to another. It’s evolving in a similar way to industrial robotics, suggesting a similar trajectory. Is RPA an invention unto itself? Or is it merely an innovation based on previously-existing technologies? These questions spark debate. For example, early software bots have been automating social-media posts, sending emails, and responding to basic web chat since the internet started taking off in the early 2000s. Similar software—in the form of interactive voice response or IVR—has also been used in call centers for over a decade. Still, neither of these technologies accurately represents RPA’s capabilities, nor what it empowers businesses to accomplish. Screen scraping, web scraping, and automated internet data-extraction programs originally came into existence before the days of the internet in order to simplify the transition from a legacy system to a more “modern” computer system. These types of software can be programmed to gather data from computer files and websites. With the rise of the internet, screen-scraping software quickly evolved the ability to extract data from websites by accessing their HTML code. However, its very reliance on HTML, and the incompatibility issues that arise from its use, have pushed many businesses away from web-scraping software —and toward more efficient, versatile, and modern technologies. Workflow automation and management software have been pivotal in improving business efficiency through the internet. While “workflow automation” as a concept dates all the way back to the 1920s, when implemented as software it can now assist with complex operations like order processing. From capturing customer contact information, invoice total, and order details to organizing all of this within your company’s database and notifying the correct employees—this software cuts down on manual tasks in order to increase fulfillment rates and success. While each of these technologies represents an essential component of robotic process automation, RPA’s whole is greater than the sum of its parts. RPA takes the most useful pieces of each of these recent technologies and refines them into unifying, cohesive software that’s easier for the average user to control (especially when compared to writing code! ), and far simpler for practically any business to implement. RPA is radically different than the solutions that came before it because it’s not dependent upon a specific programming language or a particular application. Instead, it runs at the display, or surface level, of the process. What this means, in practical terms, is that issuing commands, managing workflows, and integrating new applications can be accomplished with drag-and-drop simplicity. Furthermore, RPA takes advantage of optical character recognition (OCR) technology which allows it to adapt to changing websites without slowing down or requiring employee intervention. Today, we can think of robotic process automation as a configurable AI, perfect for optimizing business workflow. 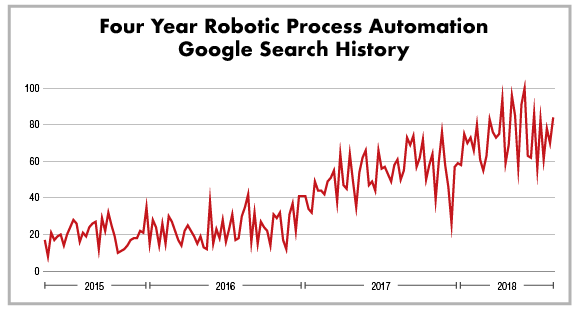 While the overall history leading up to robotic process automation software may be long, its most explosive growth and development have occurred over just the last two years. During this time, RPA has become one of the fastest-growing industries in business and technology. When considering the fast-approaching future of RPA, the terms “cognitive computing,” “big data,” “machine learning,” and “Industry 4.0” aren’t just buzzwords—they’re critical developments in progress which RPA is gearing up to redefine. The past few years have seen RPA’s meteoric rise as it’s disrupted the insurance, healthcare, and financial-service industries, but just like the evolution of industrial robots, it’s clear that RPA will find more uses and integration across nearly all industries as it continues to develop. Is Robotic Process Automation (RPA) related to Artificial Intelligence (AI)? Intelligent Automation has often been described as a continuum starting from process-driven RPA and progressing all the way to data-driven AI. However, the lack of a common, official definition of artificial intelligence has often led to confusion, particularly among consumers attempting to choose the solution that will best meet their needs. Artificial Intelligence (AI) can be defined as “a branch of computer science dealing with the simulation of intelligent behavior in computers” or simply “the capability of a machine to imitate intelligent human behavior,” according to Merriam Webster. Conversely, Robotic Process Automation (RPA) refers to “software tools that partially or fully automate human activities that are manual, rule-based, and repetitive,” as described by the Association for Intelligent Information Management. From these two definitions we can find a distinction between simulation of human intelligence (as in the case of AI) and the programming of software to perform manual tasks as denoted in RPA. Within the field of AI are other forms or subsets of intelligent automation that should be noted. Machine learning refers to the ability of a machine or system to learn from experience. In other words, the ability to arrive at a conclusion about data without receiving specific instructions for how to do so. This is achieved through the use of algorithms. Deep learning is quite similar to machine learning but is typically used for much larger data sets. Choosing between robotic process automation and artificial intelligence comes down to a number of factors such as the parameters, complexity and goals of the project. In attempting to navigate between these two approaches, it is helpful to have concrete examples and real-world applications to compare. This article will provide examples and compare and contrast use cases of RPA and AI within the insurance and financial industries. With a reported 250 robots in use, BNY Mellon has been implementing robotic process automation since 2016 to streamline its flow of operations. For trade settlements, a number tasks must be completed such as resolving discrepancies, clearing trades and conducting research. Reconciling a failed trade would normally take 5 to 10 minutes, however, RPA was able to complete the task in “a quarter of a second.” The bank claimed that general processing times where “bots” were implemented achieved an 88 percent improvement. Similarly a 100 percent accuracy rate was reported across five systems for account-closure validation processes. Trading: Trading is the activity of buying and selling securities or other financial instruments. Clearing: Following the trade, clearing is the process of managing the actions between trade date and settlement date. Clearing can be done formally through a CCP clearing house, or informally directly between buyer and seller. CCP clearing is the process whereby the CCP becomes the buyer to any seller and the seller to any buyer, so the counterparty risk is transferred to the CCP from the actual parties to the trade. Settlement: Settlement is the step in the post-trade process flow where the buyer receives the purchased securities and the seller receives the corresponding cash for those securities. Banks and brokers, as investors’ intermediaries, are involved in the process of settling trades of securities in book entry form, and in providing access to CSDs. From these definitions we recognize some of the routine exchanges between buyer and seller and how RPA could be programmed to handle parts of the trade settlement process, particularly repetitive and manual tasks. Now, let’s take our trade settlement example a step further. What if a settlement transaction is unsuccessful? How could automation be useful in helping to determine potential causes and also strategies for avoiding failures in the future? These are complex inquiries where a certain amount of analysis would be required. As such, artificial intelligence could be a useful tool. Due to the often systemic nature of settlement fails, a large amount of data would naturally be generated and recorded from these transactions. These data repositories if properly cleaned (checked for errors) could serve as the training data for an AI or machine learning solution. By analyzing the data set which may include categories such as settlement date, trade date, or currency type, the machine learning algorithms could identify distinctive patterns. As a result, these predictive algorithms could be applied to new data sets to predict the risk of settlement fail before it actually occurs. There is evidence of increasing implementation of robotics process automation in the insurance industry. Several key areas in the insurance market may be well-suited for automation include claims, product underwriting and pricing and policy administration and servicing. For example, claims processing often requires a substantial amount of staff time and coordination of documents. In a case study, global RPA software supplier Kofax described how it assisted a client with automating its claims processing routine in an effort to achieve greater efficiency. To better understand why RPA was a good fit for Safe-Guard’s operations, we will explore the stages of how this process was carried out. The company began by implementing a selection of automated solutions from Kofax’s product suite. An initial step for automation of the claims process was the scanning and uploading of contract and claims documentation to a central data repository. The bots are also programmed to distinguish the source of documents (such as email vs. fax) which accelerates the process of organizing the large amounts of paperwork. These documents are transported to a holding station or work queue prior to continuing in the workflow process. The next step entails automated extraction where information of interest (as established by Safe-Guard) are extracted from the various documents and then stored in the system. To track the effectiveness of the automation process, opportunities for improvement and areas of efficiency are monitored. The software developer reported a significant reduction in the time required to capture details from documents. Specifically, this translated to a reduction from roughly two hours to 10 or 15 minutes. Staff tended to handle documents as much as five times but RPA was able to reduce it to a single handling. Other improvements were noted in areas such as productivity and customer satisfaction increasing by 30 and 15 percent, respectively. One of the biggest challenges in the Insurance industry is combatting instances of fraud. There are significant financial implications totaling more than $40 billion each year according to the Federal Bureau of Investigation. How could automation be used to detect or help prevent fraud? Since a combination of pattern recognition and predictive analytics would be needed in this scenario, An AI solution could possibly provide useful insights. For example, companies such as H20.ai which has developed a machine learning platform with a reported 14,000 client organizations, provide AI solutions for the insurance industry. After undergoing a training process using data from insurance fraud cases, a machine learning algorithm would be primed to recognize patterns linked to fraud risk. Using a probability scale, claims with low or minimal risk would be advance for processing while those with higher risk would be flagged for review. One may also envision an AI assisted RPA solution, where the initial automation can be achieved through basic programming and the analysis of risky claims would be supported by AI. AI models could provide insights into why claim denials by pinpointing the main aspects that a human analysts should focus on. Targeting these areas helps to minimize labor, accelerate processing times and reduce errors. Customers may also find these solutions helpful as they can be informed of issues with their claim before they are submitted for processing. This helps reduce rates of fraud by streamlining the overall process for a more efficient workflow. The RPA market is still emerging and evolving, so competition among software developers and providers is intense. This provides you with choice—and decisions to make. When comparing RPA software for your business, pay attention to technology features (such as the ability to work assisted and unassisted), ease-of-use/UI (user interface), security, integrations, and vendor support. Other major players include OpenSpan, Work Fusion, Kofax, and EdgeVerve. Blue Prism offers one of the most complete packages of robotic process automation software. That’s not too surprising, considering that the term “RPA” was coined in their own labs. Replete with enterprise features including security, and a well-thought-out operating model, Blue Prism provides a sophisticated level of customization and depth of implementation for complex user processes. Some of their partnerships include NHS, Accenture, Haxaware, Hewlett Packard Enterprise, Capgemini, and IBM. UiPath has a highly customizable and extensive architecture, infused with features like predictive analytics, open-platform customization, and a sleek interface. This combination, along with its vendor support (as with Citrix), has earned them an excellent track record for automation support and security. UiPath RPA software supports some of today’s business giants like SAP, Ernst & Young, J.P. Morgan, Deloitte, and the BBC. Automation Anywhere is a pioneer in the intelligent digital workforce and one of the largest providers of RPA software across the U.S. As one of the most powerful RPA tools with one of the easiest-to-use interfaces, Automation Anywhere boasts partners such as EMC2, KPMG, Genpact, and Infosys. As we’d hinted earlier, RPA software bots can be broken down into two basic categories: attended and unattended. They’re both similar: Each can bring greater automation and efficiency to a system. But “attended” and “unattended” bots operate according different definable parameters. Importantly, the two types of bots perform different tasks with varying amounts of required human interaction. Attended RPA works alongside the user, helping him or her to incorporate automation into a specific directed task. In this instance, the attended bot is usually constrained to the programs running on a single workstation at a time. An attended RPA bot requires a human to tell it to start working. For example, let’s say that Sally, one of your employees, needs to scour her in-box for every email with a specific subject, and then copy the details from that email and paste/record it into a separate program. With her attended bot at her side, Sally could simply tell the bot to “process this,” and the bot would dutifully complete the entire grueling task in an instant. Call-center and customer-support operators can also make efficient use of attended RPA on a wide scale. That’s because these positions often require quickly switching between multiple programs and screens to retrieve information while talking on the phone with a customer. Attended RPA bots can help these employees interface with and retrieve data from any number of applications; they can also accomplish these tasks far faster and more efficiently, freeing the reps to focus more on the customer. While attended automation is well-suited to tasks that require human-to-system interaction in real time, unattended RPA is far more efficient for all other systems. Unattended RPA doesn’t require user input or attention, once the program is set up to execute. The only human intervention required would be to evaluate and/or change the directed task, since these bots work 24/7. Think of Sally from our earlier example. When it comes to scrutinizing incoming emails, finding the right data within them, and then pasting that data into another system, Sally could derive even more benefit from an unattended RPA tool. This bot could effectively manage her email account entirely on its own, watching for and transcribing incoming data from emails with specific subject lines—and then immediately sending that data onward. Unattended RPA’s higher level of automation makes it an enticing candidate for most businesses. Still, the strict rules and structure of digital information required to guide each bot make this software impractical for many complex applications. Therefore, many businesses are finding that the optimal solution for increasing productivity entails a balanced combination of attended and unattended RPA tools. But if the history of RPA and the rapid development of AI are any guide, it seems all but inevitable that nearly all RPA will become unattended, not long from now. Banking RPA – The Ultimate Guide to Robotics in Banking with Use Cases, Case Studies, Implementation Plans, and more! 30% to 50% of RPA implementations fail because companies focus too much on the technology itself, instead digging deep enough into processes, at the individual work activity level, to determine the optimal robotics use cases. Just because you can put RPA on a process, doesn’t necessarily mean you should. Understandably, many businesses are not even aware that RPA exists to make their processes – and therefore the people who form the business – more efficient. Think of it as a no-code automation solution that makes everyone’s working days easier by reducing the monotonous and routine data movement tasks they get hung up on. In fact, in the 2017 Randstad Employer Brand Research survey, 40% of respondents said they think automation would make their jobs easier and an impressive 72% said they didn’t mind retraining for job changes as long as their pay remained the same or increased. To ensure that your RPA implementation goes according to plan, follow the steps outlined in the four phases below to show your employees and leadership why RPA helps them, not replaces them. Determine what processes are core to your business, what processes are secondary, and what processes are redundant. You never want to automate redundant processes, as they should not be there anyway. Those processes should be leaned out before any RPA thrown at them as a solution. As you refine the scope for your project, focus on processes that are performed by the largest scale group in your company to maximize the return on investment. For RPA, focus on processes that are core to your operations, but require employees to move a lot of information around, then begin to narrow the scope down to individual use cases from there. One telling metric is to look at the data related error rates of each department and determine where those errors are happening; often it’s in processes that involve manual data movement. These are prime candidates for RPA. There are numerous ways to identify which routine processes are accounting for most data transcribing related productivity loss. If a department has been struggling to meet volume and productivity KPIs, they could benefit from RPA, which is able to perform data movement tasks much quicker than human workers and can work around the clock – 90% quicker. By using RPA to automate these actions, you increase efficiency and spare employees from the dull clerical data movement work they don’t enjoy. Never attempt RPA implementation, or buy robotic process automation software, before determining the use cases that you want to implement. RPA software is expensive and requires year-long licenses. Most consulting firms will attempt to sell as many licenses as possible to you, or do a million-dollar analysis project, before looking for use cases. Take the opposite approach – find your RPA use cases first. This is not only the more cost-effective approach. It also allows you to purchase “a la carte” robots and only what you need. When implementing RPA, at first start small, successfully implement several uses cases, then scale up, and repeat. Don’t go big at first. Robots tend to have staff telling coworkers about how cool RPA is once bots are implemented since they reduce boring work. Robots tend to have an almost viral internal word of mouth support that comes post-implementation. This is why it is critical to only implement 4 or 5 quick hit RPA use cases over a few weeks as it is a much safer way to approaching RPA for gaining internal support. If done right, employees will be asking for many more bots. So, how do you identify individual RPA use cases? Let’s get to that now. You must map processes to find the big-wins, but you do simple employee interviews before that to jump-start your small-scale proof of concept for RPA. What work do you do that you copy and paste data from one place to another frequently? Is there any data movement work that you do that feels like a repeated waste of time? Do you send the same types of emails over and over throughout the day? Do you repeatedly move invoices or files from email to a folder, or system? The most effective (and correct) way for identifying all your high-value RPA use cases is by mapping end-to-end processes. This takes time and can be labor intensive. But, The Lab can complete wall-to-wall process mapping for RPA use case identification within 6 weeks – be sure to contact us about this if you need help. Next, think of all the ways that RPA can affect costs when your day-to-day processes are supported by implementation of robots. Don’t just think about how RPA can reduce your overhead – though that’s definitely part of the appeal. Identify the ways that RPA may impact downstream operations in other areas of your business as it’s rolled out. These may look like an increased number of support calls, more time invested in updated employee training, and increased troubleshooting time when your bot need to be reconfigured. But, unlike the complex rollout of enterprise level Business Project Management programs, calculating the ROI of RPA is fairly easy from a cost savings perspective. (Total number of hours per week an employee works that the RPA use case applies to) – (time saved by the RPA use case under consideration) * (fully loaded employee salary with benefits – RPA software cost for one year) = total savings from the individual RPA use case. Now do that calculation for each RPA use case you are considering implementing to build out your business case for scaled up robots across your organization. Then spend time with your leadership team, IT team, and other stakeholders identifying the additional ways that RPA could be implemented now and the opportunities for it in the following 6 to 12 months. Robotic Process Automation for your business, from start to finish. Contact us now to speed up your RPA analysis, use case development, and implementation.